lake | I'm not stalking you. Pretty standard picture you will see on postcards and mugs of Point Betsie Lighthouse. After the first two excursions, my mom, and later my husband, would feed my enthusiasm for lighthouses of the Great Lakes. Whenever there was one on the way to our destination (which can happen surprisingly often when traveling in Michigan), they would let me stop. I also got a book that listed all the Michigan Lighthouses and how to reach them. This was very handy in the days before the Internet and Google. That is how my future husband and I managed to find Point Betsie, one of the most photographed lighthouses. I wondered how it could be the most photographed when it is not the easiest to find. We had to turn down a little unmarked road. Where we turned, we could not even see that Lake Michigan was ahead of us. 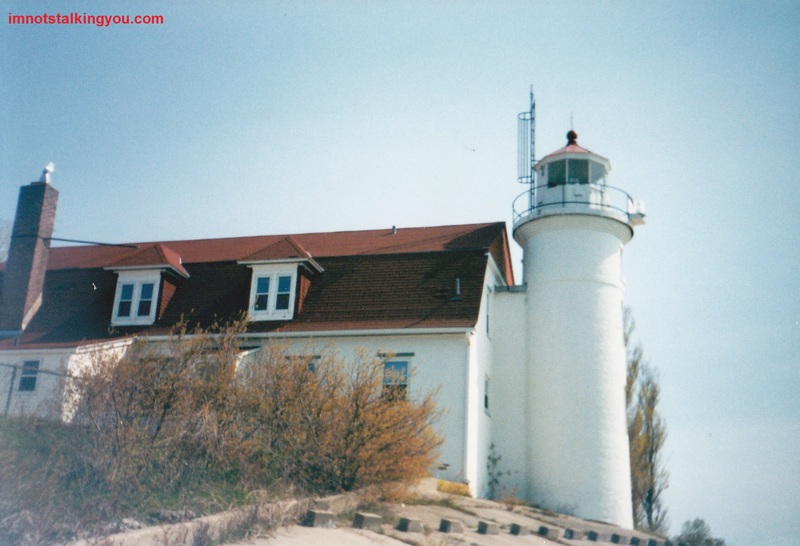 Point Betsie was still active and run by the Coast Guard when we visited in 1998. This meant there were no signs screaming “Hey, must see tourism attraction here!”, because the Coast Guard didn’t want any. The road ended at the lake, where a make-shift sand parking lot had been created from all the lighthouse buffs driving over and killing the sea grass. My future husband knew this was killing me. He knew I would never disobey the signs. Not on my own, anyway. So, he went over to the lighthouse first. He stood by the tower. I took pictures of him. He kept egging me on until I stood by the tower so that he could take my picture. 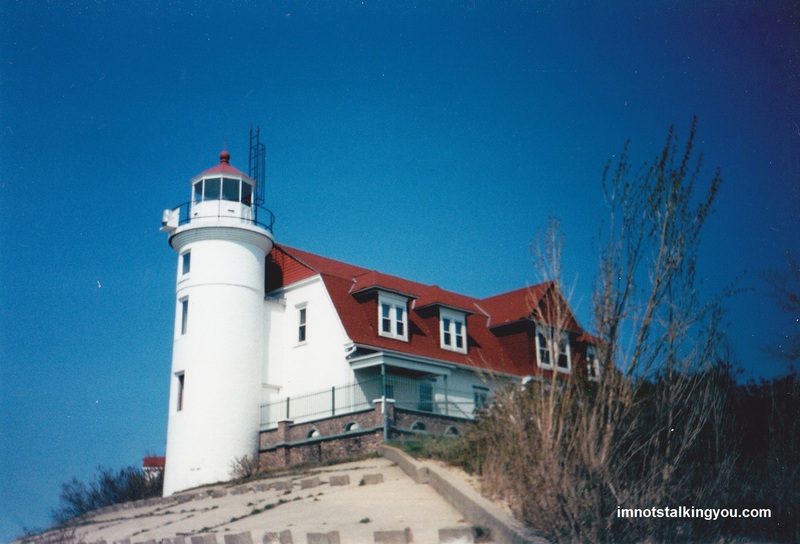 All the pictures you ever see of Point Betsie (postcards, calendars, mugs, etc.) are from the south side. But I have some from the north side, that totally prove my guilt beyond a shadow of a doubt. But it was so much fun! The naughty, totally trespassing side of Point Betsie. And Point Betsie really is a beautiful lighthouse. But I still think Marblehead is more picturesque. My husband so let me indulge in my lighthouse obsession that I turned our honeymoon into a lighthouse tour of Michigan. Not only did I make him stop at every other lighthouse (and even a few range lights) on the way to the Upper Penninsula, but we actually spent three nights at the Big Bay Point Lighthouse, which was one of only two lighthouses in Michigan at the time that served as a bed and breakfast. Big Bay Point Lighthouse, Big Bay, Michigan. My husband and I stayed on the second floor, in the window on the left in this pic. It still an actual working beacon maintained by the Coast Guard. But you can crawl all over the tower and lamp room. The first night my husband got to see the Aurora Borealis from the tower. I stayed in our room because I was too exhausted to climb all those steps and the tiny rung ladder again. Big Bay from the front. Most publicity pics are from the side. It was so cool to know that a working lighthouse was beaming out across Lake Superior as we slept. The second night, it was too foggy to see much at night. The third night, we could almost make out the surrounding lighthouses flashes in the night. One night we sat in the parlor/library with some of the other guests. My husband drank coffee, I had hot cider. While other people took normal books off the shelf to browse, I selected the giant white binder on lighthouse preservation. The whole first half of the book was about how to stabilize your structure and prevent further damage from the elements and vandals while you tried to get funding to restore it. I felt like I had found secret insider information that I was not meant to see as a paying guest. During our stay, my husband and I also got a couple’s massage in a screened hut on the edge of Lake Superior. The waves crashed below us against the cliff. It was awesome. I could go on and on about lighthouses. I would love to make a whole page of my blog be photos of lighthouses I have been to. But that would probably eat up too much storage space. But that doesn’t mean I still won’t do it someday. Looking at the book I have, Michigan Lighthouses by Penrose, published in 1996, it strikes me how the authors are lamenting over structures that have been ignored for decades and are about to crumble when the next seagull perches. But, interest in lighthouses has only increased. The cries of the Penrose family, and others, has indeed raised awareness in recent years. 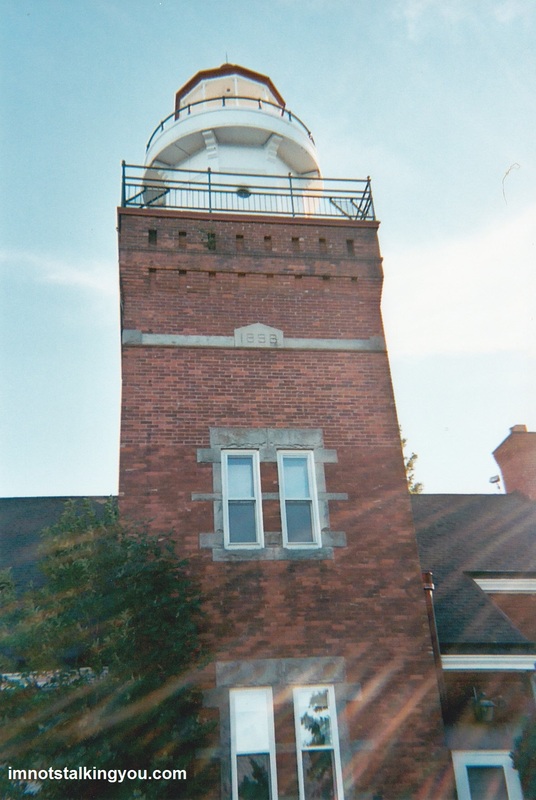 When my husband and I stayed in Big Bay Point Lighthouse, it was a rare opportunity. Nowadays, it is becoming common. 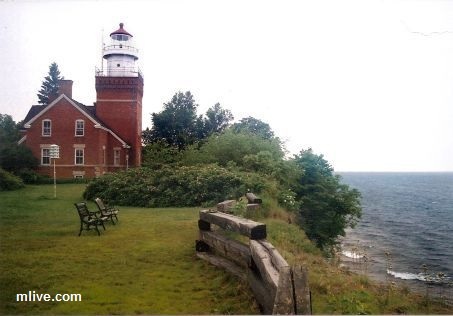 I mentioned that when I visited Point Betsie, it was a Coast Guard residence. Now you can rent the whole place out for yourself. The keepers house for the Charity Island light was literally being ripped apart piece by piece for firewood by campers. It has since been rebuilt and is also a rental. There are more towers open to the public to climb as well. ** Tower climbed while I was pregnant. That should totally mean extra bonus points. Posted in Childhood Reminiscing, UnProfessional Photography & Artwork and tagged Anatomy of a Murder, bed, Big Bay, breakfast, Coast Guard, couples, Frankfort, Great Lakes, honeymoon, Huron, lake, lighthouse, massage, Michigan, photography, point, Point Betsie, Superior. Bookmark the permalink.